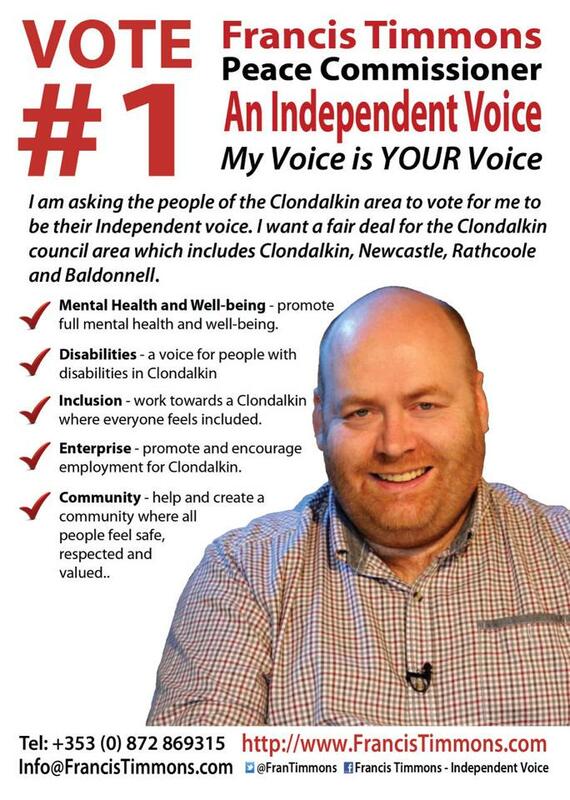 I would ask that Clondalkin made up of areas of North-Clondalkin , Bawnogue , Cherrywood , Green park , Clondalkin Village , Woodford etc. are all kept together in any redrawing of any new constituency and no attempt is made to Divide these areas as part of Any new constituency as not to isolate any part of the Clondalkin . The area of Saggart/Brittas needs to be included as the Clondalkin area, the Clondalkin Area map needs to reflect the constituency of ‘’Dublin Mid-West’’ to allow for a more joined public representation model. The Balgaddy / Foxdene area needs to be included as Lucan – Palmerstown area unless the area is changed to Clondalkin , The area address is Lucan but the Electoral area is Clondalkin this has caused a huge confusion for residents in who represents them. To arrive no later than Monday 19 February 2018 at 5pm. Very Glad that so far 2 Independents , 1 Sinn Fein , 1 People before profit . 1 Workers Party , 1 Fine Gael , I Fianna Fail candidate have agreed to uphold a voluntary poster ban in Clondalkin village, We also passed my motion on “This committee agrees to formally congratulate Clondalkin Tidy Towns on their second Endeavour Award for most improved in Dublin County (following success in 2013) and that they are written to expressing our gratitude for their excellent efforts and work in the area.” (A letter will now be issued from the Mayor’s Office to the Clondalkin Tidy Towns Group which will include an invite to the Clondalkin Christmas Tree Lighting Ceremony which is provisonally scheduled this year for Wednesday 8th December 2015 at 5pm. A special ceremony will be arranged at the event to formally congratulate the Clondalkin Tidy Towns Group on their recent achievements.) and I believe by passing my motion “That this area committee calls on each candidate for the upcoming general to respect the existing Voluntary Poster Ban in Clondalkin Village.” we are reaffirming and supporting the excellent work done by Clondalkin Tidy Towns. Balgaddy – another Christmas of un-acceptable living conditions? Timmons for the Dáil – This is our chance and this is our time – We can make it a time of change. 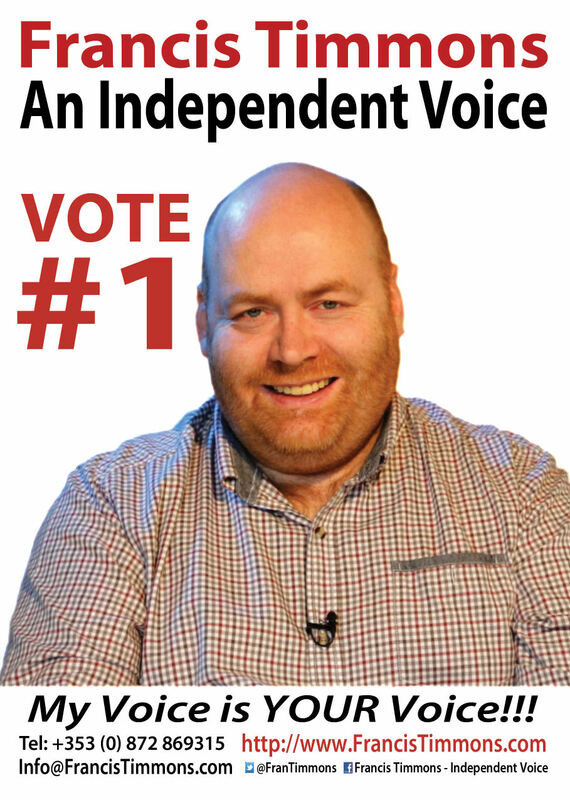 Cllr Timmons says ‘’I have decided to run as an independent for Dublin Mid-West in the next General election. I feel there has been a huge lack of representation for this area for a number of years, the people deserve better. Many people I speak to are not seeing any recovery , some struggle to pay rent or mortgage and many struggle to put food on their table. Dublin Mid-West wants and des…erves better. As a local counsellor I am raising many issues locally but as a TD I can try to effect change, we need a Left Government , we need a government that won’t leave us with more broken promises. I won’t be running promising the sun moon and stars but I will promise Openness , Honesty and transparency. I will also promise commitment , dedication and accountability. The next election is about choices and do we trust those that have let the state down since the foundation of the state? Or are we willing to look at new possibilities? Do we want the wealth shared ? do we want an end to poverty? And an end to Homelessness? Do we want real jobs and an honest day’s pay for an honest day’s work? 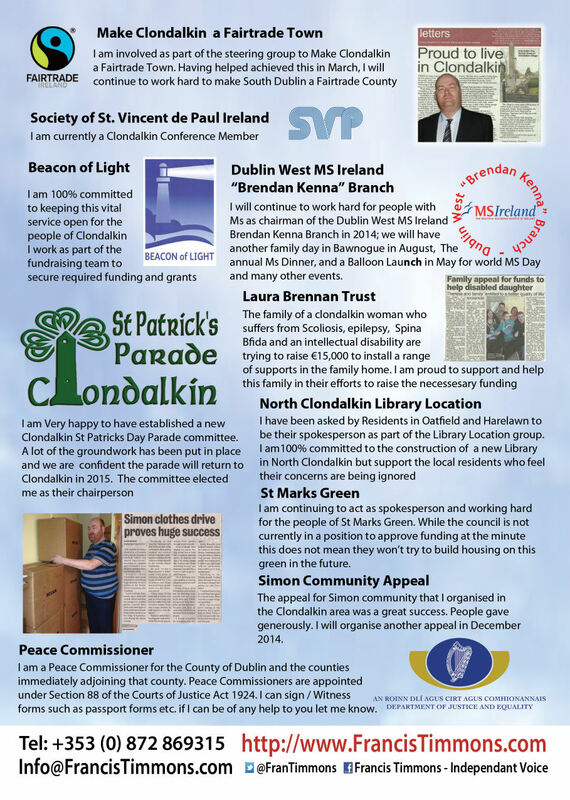 I for my part will not be joining any party or grouping in my campaign I will be running as a total Independent I don’t have the huge resources to put posters on every lamp post but I do have the Loyalty and commitment for the Dublin Mid-West area. I want to hear what’s important to you? Contact 087 286 9315 or email ftimmons@cllrs.sdublincoco.ie . This is our chance and this is our time – We can make it a time of change. starting on 11th April I will be holding the following Dublin Mid West constituency clinics. Please contact me by phone or text at 087 286 9315 087 286 9315 if you would like to meet and discuss any issue. Times will be 2-4 and I will also be available to sign documents as a peace commissioner. I would like to thank all who have helped me during my Election campaign – my committee Darren Lamont , Paula Kenny , Eddie Kinsella , Stephen… Hand , Angela Connolly , Caroline McKiernan , Maria O’Neill Mc Grath , Paul Alford and Geraldine Goodwin . Also all those who helped deliver Leaflets Darren O Donoghue , Terry Monaghan, Susan D’Arcy , Wally Whelan , Chris O’Brien , Emma Keegan , Geoff Keegan , Elaine Keegan , Madeline Keegan Byrne , Veronica Power , Deirdre Kearney , Karen Geoghegan , Antionatte Burtenshaw , Mark Aherne , Ingrid Munnelly Aherne , Sean King , Kevin Oreilly , Ann-Marie Joyce , Karla Moody , Gemma Moody , Caroline Anne Corcoran , John Timmons , Pat Heffernan , Cathy White , Joan Smith Rafferty , Peter Oreilly , Jane Marie Conlon , Oatfield Harelawn and The Many people who took house/car posters Geraldine O Reilly , Chrisy O Sullivan Burgess , Andrea Purdue , Anthony Moody , Carmel Shanahan , Rosie Harcourt , Mick Murray , Mairead McBreen and Gerard Courtney and Denis Whelan for help putting up posters. Also Animal Ark (Geraldine Haskins and Amanda Haskins )and Shell’s Styles (Shell Cribbin ) and other shops that took leaflets to put out for me. Thanks to Gerard Hyland for sorting office space for me. Thanks to The Waterside Bar Clondalkin and CPM Sports and Social Club for there help in Fundraising and of course all my Friends and Family who have been supportive and my wonderful Facebook family that have listened to me over the campaign. If you don’t VOTE your VOICE won’t be HEARD! If you are Not Registered you cannot VOTE! For inclusion in the supplement to the register, application forms will need to be received by the registration authority for the area in which the applicant is resident not later than 6 May 2014. For those seeking inclusion in the supplement to the postal and special voters lists, the application forms will need to be received by the registration authority not later than 26 April 2014. I can email you a form if you need one.